Tyngsborough, Massachusetts, a town of about 11,000 on the New Hampshire border, 28 miles north and west of Boston. A family living there were excited to see a couple of Bobcats hanging out in their yard. So were the Boston TV reporters. It's fun to spot something bigger than a squirrel or woodchuck in your yard, or even your town. Fox, Coyote, Big Cats, Deer, Moose, or Bear are pretty rare sightings for most Americans, and that's kind of sad. Most of us live in pretty close proximity to each other these days. The majority of parents demand any ground the kids can access be made safe from Mother Nature's teeth, claws, hooves, barbs and spines. My god, the children, won't somebody please think of the children. So I guess if the critters showed up they'd be tarred & feathered, then run out of town on a rail. I'd love to see bobcats. So far, just foxes (who scream in the most bone-shivering way during mating season ... ), a very occasional coyote, and prey animals. If I could keep the hunters off my bit of land, maybe I'd see a predator. I've seen both a bobcat and a bear here. It is pretty cool. 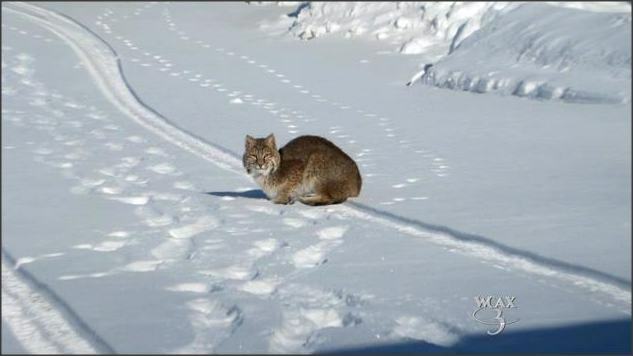 The bobcat population is on the rise. Used to be, if you saw a live bobcat, you counted yourself a member of a very exclusive club. Around here, the increased visibility of the bobcat is not due to habitat encroachment. There's just more of them. Our bobcat season harvest records back this up. The 2013 season shows 3189 bobcats taken in KY. This number astounds me. I'm just freaked out by the number of familiar names on that map. Which is silly, because I've known since I was ?14? and first studied American history that that was the case. Seems more real when it's on the Cellar though. I've never not ever spotted even a squirrel in our back garden. That's Skwi-rell BTW, not Skwirl :LOL: I envy the 'rents and their soon-to-be-garden, because I bet they get squirrels there. But before the housing estate grew up aroud us I regularly saw foxes (not urban, the ones that ate mousies) low-slung grunting badgers, bats which looked like wind-up toys flung into the sky, and rabbits grey as dawn. I miss the connection with nature and with the seasons. Limey sees more - far more. I saw my first ever hare from her window. And her whole world changes every month, but every month it stays the same. Oh, we harvested 40,109 coyotes which the state pays a $25 bounty on from a $700,000 fund the legislature set aside. :confused: Couldn't they just start a rumor the Coyotes are moving into the state to sell crack and let the thugs take care of it? Also 343,110 deer, plus probably another 100,000 on the roads. Issued 72 Elk permits which yielded 72 bulls, 14 over 700 lbs. What surprised me was 3,510 bear, 58 over 500 lbs, and one at 772 lbs. A 772 lb black bear!! That's a Sasquatch. Interestingly, we just today got a notice from our MUD about coyote sightings and missing/mutilated pets in the area. They claimed that shooting them just makes room for another one to move in, and they will instead be clearing underbrush and generally making the environment undesirable for them so they will go away on their own. I'm dubious. Predators are necessary for a healthy ecosystem. We ruthlessly exterminate every predator we can and then lament that we're overrun with prey animals. Nancy Hill thought the cat needed help. "It was below zero and I thought the poor cat needs to get in and thaw in warmth," said Hill. Looking out her Greensboro window on Town Meeting Day, Hill said she saw the animal sitting under her bird feeder and sprang into action. "I used to have a cat and I had a cat carrier," said Hill. She grabbed the carrier, dashed out the door, fast approaching the feline and finding something wasn't right. "There was quite a bit of blood and some fur," she said. And as Hill got close, she quickly learned the cat was no kitty. "Well once it got up, it went so fast, it was scary," said Hill. Hill almost caged herself a bobcat. We've all held a 2 pound kitten that went batshit crazy, and turned into a furious ball of teeth and claws and owfuckshitgetitoffofme. You can't get rid of one fast enough. Now imagine if it was as feral as possible, and weighed forty+ pounds. A healthy bobcat can bring down a half-grown deer. Not all of us ... cats get an undeservedly bad rap.